Deliciously Raw-Easy Recipes for the Omni Blender is included for free with your Omni Blender purchase. It features 52 real vegan and vegetarian recipes on 82 pages with colorful images. It is difficult to make healthful good tasting smoothies if you do not have the experience that professional smoothie blender demonstrators have, like at Costco. The reason is that phyto-nutrients are magnified and released by breaking down the cell walls at a much higher rate than through chewing or blending with any mediocre low-powered cheap blender. In other words, the nutrient potency is significantly higher in smoothies made in high performance blenders, like in the OMNI Smoothie Blender. This recipe book contains recipes that are healthful and good tasting, especially in answer to a higher amount of newly released phyto-nutrients. Learn how to make raw smoothies, raw fresh hot soup, ic e cream, pate and puree, peanut butter - better cashew nut butter, and a few more different things the real vegan and vegetarian way. Carmella Soleil is the author of the recipe cookbook. She has been a vegan for many years. Deliciously Raw "Easy Recipes for the OMNI Blender" should have really be named "REAL Vegan or Vegetarian Recipes" for any high performance blender. The raw food smoothies and purees and meals depicted in this fantastic raw food book are healthful and make total sense. 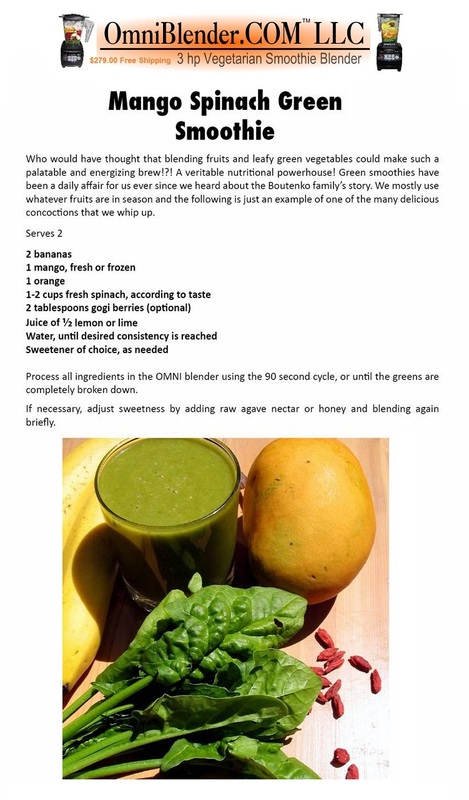 The recipes are practical and by applying them you will learn how to use the OMNI Super Power Blender (and any other high-performance blender). And not to forget, there are 57 recipes to practice with. This should be enough to get you going with a new raw food lifestyle. Enjoy the healthful raw delicious concoctions. The OMNI V SUPER Blender is every bit as good as its higher priced competitors. "The thing, ...less money". More Information. The recipe book has 82 pages of great healthful recipes, most of them being vegan, but for sure all are vegetarian recipes. The book has been authored by Carmella Soleil in 2011 and published in conjunction with OmniBlender.COM LLC. I was personally a vegetarian for about a year. Man, that was hard. It is really difficult to go up-stream against the grain of a culture. The social habitual food and eating-out pressures are real. Causing positive change in your new lifestyle is going to be a learning experience and a challenge. Today I am about 70% raw-food vegetarian, mostly eating fruits and vegetables, not always in form of a smoothie. And I eat all of that RAW too. As you can see on the picture to the left above, yes, the blender container has an avocado pit in it. I blended that up and consumed the whole delicious smoothie. I have to say, it came with an acquired taste for avocado. But the pit is not really tasty. You may need to work around that. And in no way, of course, am I implying that you should eat the avocado pit for health reasons. The FDA is real serious about the making of health claims. Blended in the OMNI 3 HP blender for 60 seconds to 2 minutes, depending on smoothie preference. You can make this smoothie in other high performance blenders as well. However the smoothie is not necessarily going to turn out the same way, taste-and-texture wise, if you use a Kitchenaid or a Ninja blender, for example. It you will also lack the higher level of phyto-nutrition because of the poor blending power. Finished fluid ounces is about 30 to 32 oz. This yields in one healthy and very nutritional smoothie diet lunch. I am not 100% sure, but because there are lots of greens and fresh vegetables and fruits in this smoothie, I bet you, this smoothie could be good for me in many wonderful beneficial ways.